Altar of Despair is a legendary Neutral support card. It is part of the Madhouse Collection. 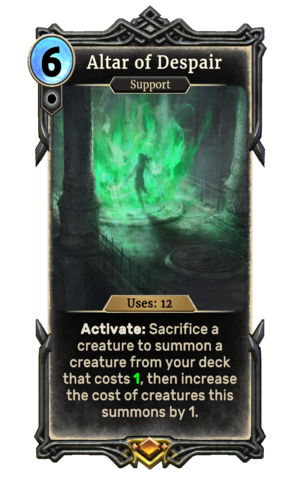 It was available in the promotional Madhouse Collection pack during the Chaos Arena event. The Altar of Despair, located in Cylarne, first appeared in Shivering Isles. When your deck has no creatures at the cost Altar of Despair is attempting to summon, it will instead produce a Sweet Roll. This page was last modified on 11 December 2018, at 00:30.